Art Deco | My "Marketing Nirvana"
Anyone who has traveled across the Golden Gate Bridge on a sunny day is taken aback by the breathtaking experience. And although this past Sunday the architectural gem turned 75, for me, the Bridge will always represent the epitome of the best of what art and science coming together have to offer, in this case an Art Deco masterpiece made possible by an engineering tour de force. The Golden Gate Bridge is an American icon, notes Spencer Michels of PBS. Open to the public originally on May 27, 1937; many feel it symbolizes an eternal optimism. 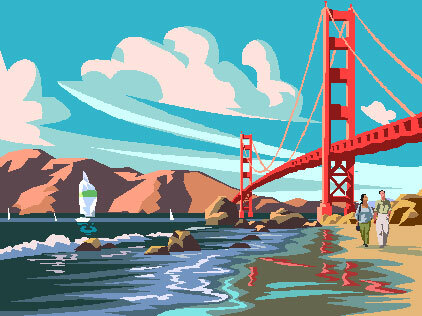 One only has to visualize its vibrant International Orange hue in tune with its surroundings, coupled with the virtual connection of the San Francisco Bay and the Pacific Ocean to share in this feeling. Structurally, the single-span suspension bridge was built to withstand the test of time; form follows function in effect to weather the elements. No doubt appreciation of its eternal beauty will continue. The 75th celebration included a photo contest on Facebook, endearing the Gate to another generation. So, what’s your favorite bridge? What are the benefits of art and science teaming up? The Golden Gate has succeeded in capturing our hearts and minds; let’s hope the Bridge and the beauty it represents endure for the next 75.